Michele actually made these, but I found the recipe. By Far the best recipe brownie. In a medium sauce pan, melt the butter over medium high heat. Add the sugar and cocoa powder once the butter is melted. Whisk to combine and remove from heat. Add the salt, vanilla and eggs and continuously whisk until the eggs are combined. Add the flour and continue to mix. Set batter aside. Cream together the butter and sugars in a mixer. Add the eggs and vanilla, making sure to scrape down the sides of the mixing bowl. Add the flour, salt, baking soda and baking powder and mix on low until everything is incorporated. Fold in the chocolate chips. Set dough aside. Line the bottom of a 9×9 baking pan with tin foil and then spray the tin foil with a layer of baking spray. Layer 1/2 of the cookie dough on the bottom of a 9×9 baking pan, pressing down to form the bottom of the slutty brownies. Reserve the remaining cookie dough to be used to make cookies later in the day. 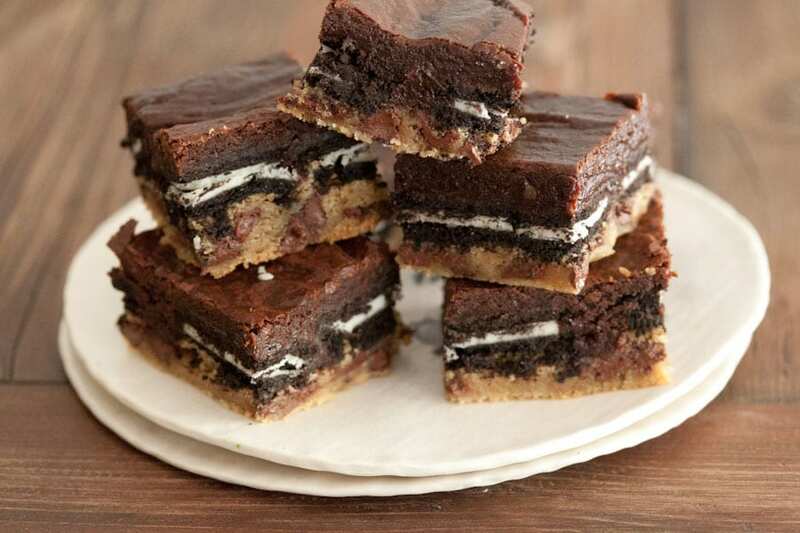 Layer as many oreos that will fit on top of the cookie dough. No need to overlap. One single layer will do. Pour the brownie batter on top of the oreo layer and make sure it’s evenly layers on top. Bake for 30-35 minutes. Test with a knife to see if the center is done. If the knife comes out clean, let the brownies rest before serving. If the knife comes out with batter still on it, allow the brownies to bake about 5 minutes more.